Anne Tanyi Tang's repertory conveys a consistent message that harmony in thought and action is a sine qua non for progress and communality. A pervasive sense of contemporary history is a marked gradient in her theatrical topography. Historical incidents provide at a conscious level the material from which her artistic periscope is fashioned. In Chief Ayito(2006), the playwright explores the possibility of the Cameroonian rich, walking in terror of the poor marginalized whose property they have stolen. Tanyi Tang's thesis is that neo-colonial despotic rule; the political and economic struggle assumes its class character despite any and every attempt at ethnic mystification. Her beauty as a playwright is seen in the fact that she planted revolutionary vineyards that should yield fruits of increase. The author has torn the sky apart and come down with fluorescent clouds under her feet. It would appear, then, that over the years, Tanyi Tang, has become as sure footed as a materialist deer. We see a playwright of admirable ideas and purposeful, matching actions. Cultural assertion is an integral part of the political and economic struggle in her morality play. It would therefore be just to approach her theatrical iconography as explorations into history conducted through the medium and convention of drama. The symmetry and aesthetic credo of Chief Ayito raises the vexed question of the role of dramatic literature in moving society forward from its present state of anomie. It is therefore axiomatic that in this play what the African leader gives to life is what he gets back; this in essence aptly explains the biblical truism of what man sows is what man reaps. Ayito betrays himself as an outright liar and thief extraordinary. The villagers of Mamfie unanimously agree to exile and subsequently execute him. Those who have therefore taken more than a cursory look at the plot and structure of Tanyi Tang's one act morality play will notice that she has built her theatrical nuggets on the deep waters beneath the earth and laid the foundations in the ocean depths. In this work the playwright is bold enough to stick her head over and above the parapet. Inefficient and insensitive leadership has been the biggest obstacle in our match to greatness. The collective condemnation of Chief Ayito's attempt to tinker with the constitution that would have transmogrified him into a Pointing Rod, Father of the Nation, Pedagogue etc., is championed by the greater Mamfie civil society. Tanyi Tang's play aims at helping the ordinary people recognize their hidden talents and tap into them for better use. It is commendable having dramatic literatures like this as the Cameroonian society strives to make sense of itself. T.S. Eliot argues in "Religion and Literature" that the greatness of literature cannot be determined solely by literary methods,” but whether it is literature or not can only be determined solely by literary standards (Cited in Chinweizu, 1980). Drama develops through the synthesis of conflicting ideas and positions. Social scientists such as Karl Marx, Cheikh Anta Diop, Theophile Obenga, Emile Durkheim, Claude Ake, for instance, tell us that conflict is not only endemic of all human societies but it is the mechanism for social progress and cohesion. In Eneta Vs Elimo (2000) Tanyi Tang, had cauterized a nation that has been eaten by ethnicity, corruption, nepotism, hate and envy instead of prosperity, liberty, and brotherhood. I find it interesting, even instructive, that in the attempt to electrify the ambience of governance, we see a determined will, on the part of this playwright, to be committed; to championing a cause. There is no denying of the fact that Tanyi Tang, in her socio-political satires, shall not, and cannot, afford that cold, conspiratorial hubris, which forecloses the future of our children and true destiny of the Cameroonian nation. Whether in Ewa and Other Plays (2000) or in Visiting America and Marinuelle (2006), on the other hand, we come across the story of the Cameroonian woman both in traditional and contemporary settings and her struggle to grapple with issues of survival in an environment where patriarchy has been uncompromisingly established. It is as if the playwright has flown swiftly on a Sartrean creature; as if she has traveled on the wings of the Fanonian word. In a nutshell, we see a definiteness of purpose, the ability to go the extra mile, to transform talent to genius. In Chief Ayito dramatic conflict has become the powerhouse of thoughts that usher possibilities that would elevate human struggle to greatness. The playwright has strongly expressed her awareness of the unbroken inter-relatedness of the cultural side of Mgbockndem and social reality around her in which politics and economics feature prominently. The emancipation and welfare of the masses and peasants and workers of her fictional Mamfie is held up as an index of growth in society. A reactionary, moribund society, like that of Chief Ayito, can only produce an oppressive, neurotic culture that cannot nourish and edify man. Tanyi Tang's thesis is that under neo-colonial oppressive rule as in Chief Ayito, the political and economic struggle assumes its true class character despite any and every attempt at ethnic mystification. We have not cultivated the attitude of openness and tolerance in our dealings with one another. Poverty is pervasive in spite of the hands of a few individuals. Megalomania and tribal bigotry stand at the midriff of our obstacle to attain the best we hope to be as a people and a nation. Chief Ayito advocates the rallying of the people behind the cause of arresting the inexorable slide towards autocracy and kleptomania, nepotism and monolithism. The drama advocates ways by which despotic leaders can be held accountable for their deeds, which go a long way to foster iniquity in society. 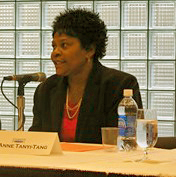 Tanyi Tang suggests that what should be on board is greater accountability, strengthening of the instrument of the state such as the judiciary, the legislature, and above all Cameroonian civil society. The playwright has demonstrated adequate understanding of the techniques of writing for a target audience. The language level is pitched at the appropriate level and the uncomplicated plot of her moral fable makes Chief Ayito very appealing for performance. Overall, Tanyi Tang's plays are recommended for persons who desire to appreciate the beauty of drama in its readable form and on stage. PRONKO, Leonard Cabell (1967) Theatre East and West. California: UP. Playwriting is not cramped to a particular sexual category. I am delighted to hear a female voice in print. My desire is to see more female Cameroon writers. Women have an emblematic status in creation. God coroneted creation with the creation of a woman. He didn’t see the need of creating any other thing after the creation of Eve. A woman is man’s helpmate in every sense of the word. The artistic faculty of female writers must be there in my view to buttress the works of their husbands. I hear hysterical husband tracking has become the part time job of some women in many parts of the world. In cultures where this avowal is spot on, there are women authors. I yearn to listen to what the mothers of our Nation have to say in publication. Thanks BB for making your site accessible to all. Although Anne is my in-law and we are from the same rural community, I wouldn’t have heard of her play. Bad news journeys at the speed of light. If she was death ( God forbid she will live up to ripe age) I would have known the same day even if I was in a grotto in the Bermudas. I am on familiar terms with the fact that it’s not easy to get a play on stage with today’s high cost of production. There is nothing impossible with God. Don’t get off your present balustrade Anne. Madam i am a fan of Ur drama text especial Visiting America and Eba.U are a woman of substitute and intelligence.Am a student in the university of Yaounde1 studying English Modern Letters.May God give u long life. she is one of those African writers who bathed themselves in the aqua of the academic cross current.i am very proud of not just because she is my aunt but also due to her manier in doing things dat have touched many lives.